A worker was killed when he was crushed to death in a chipper machine. Someone started the conveyor at the operator’s console after the worker, who was completing repairs on the machine, had descended into the conveyor to retrieve a tool. A worker amputated two fingers and part of his left hand when another worker turned on the saw from which he was removing debris. A worker required 14 stitches to his right hand after he reactivated a bending machine while changing the die. He accidentally touched the foot pedal, which activated the machine, and the die lowered on his right hand. 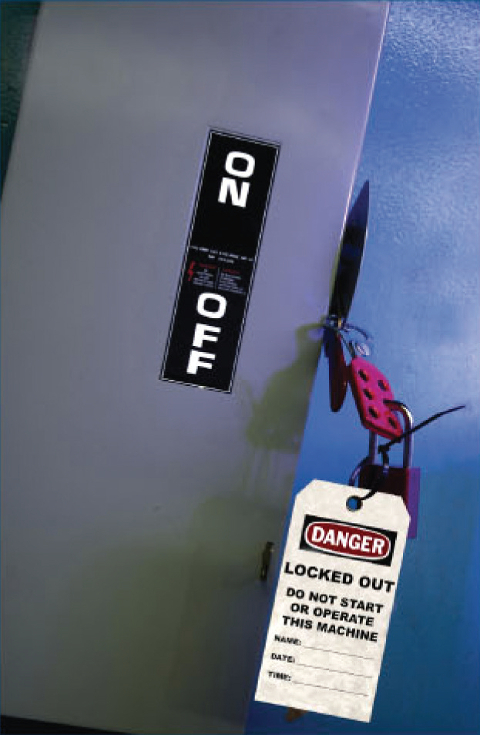 Equipment: Employers shall ensure that a machine has a properly identified, lockable means of isolating the energy source, in a location familiar to all employees. The employer shall also provide a safety lock and key to employees who may have to lock out a machine. a) No employee can work on the machine until a competent person has put the machine in a zero energy state (see Zero Energy State – Safety Considerations, below). b) Each employee working on the machine must: verify that all potential energy sources have been made inoperative; lock out the machine using the safety lock and key provided by the employer; and attach a tag to the lock. c) Only the person who installed the lockout device or tag on a machine may remove it, except in an emergency, or where attempts have been made to contact the original installer. Training: Employers shall ensure that an employee who may have to lock out a machine has been adequately trained to do so, and is acquainted with the hazards associated with the task. Code of Practice: Where lockout is inappropriate, the employer must establish a code of practice in consultation with the joint health and safety committee or health and safety representative (if any), to carry out the work safely. - Pressurized fluids and air. - Accumulators and air surge tanks. - Kinetic energy of machine members. - Loose or freely moveable machine members. - Moveable material or work pieces that are supported, retained or controlled by a machine and that could move or cause the machine to move.